In textile classifications, there are only two types of true lace. Bobbin Lace with is akin to weaving and Needle Lace with is akin to knotting. All other laces are imitations of these two. I tried Needle lace, but lack the patience to produce two million buttonhole stitches. But it is so so beautiful. I also lack the patience to really make Bobbin Lace. Bobbins are wound in pairs. So if someone says they have 50 bobbins on their pillow, they really have 100 bobbins. And while it looks very impressive, like knitting with double point needles. You only work 4 bobbins at a time. No matter how many are on the pillow. If you can count to 4 and know your right from your left you can make basic Bobbin Lace. The learning curve is steeply upward from there. There is a lot of leeway in how Bobbin lace is worked. Size is left up to the lace maker. How the bobbins are hung at the beginning is also left to the lace maker. 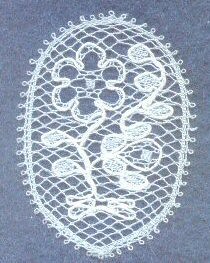 And if Kirchner stitch makes your teeth hurt, try sewing together pieces of bobbin lace made with thread finer then your eyelashes. Wow the lace is pretty. Are you guys as soggy as we are after yesterday? Suzann, that lace is gorgeous! I cannot imagine the skill involved in your lacemaking - knitted, tatted, bobbined (???). I went to the site and man, oh man, are those hanging bobbins macabre! That's a really weird way to commenorate a hanging. Come to think of it, it's really weird to commemorate a hanging to start with. Fascinating stuff. Lovely lace, you have such patience. About ten years ago I took some tatting classes - I love the end result but it takes so-o-o long to see any reward, it soon fell off my craft radar, along with my quilting. Maybe I'll pull it out and see what I remember :).